It’s important for lawyers to be aware of the technologies that can affect their practice. As with any other business, technology plays an important role in the legal field. No matter what type of law you practice, your firm can’t do without it! For many lawyers, this isn’t an easy pill to swallow. They don’t want technology replacing their work. Yet, that’s not why we turn to tech. They help us do things faster and complete tasks that would otherwise be impossible or unrealistic! They have the ability to increase our efficiency, connect with clients easier, and help us do even better at our jobs. The list of benefits is pretty much endless. The legitimacy of your firm depends on having the proper technology in place. 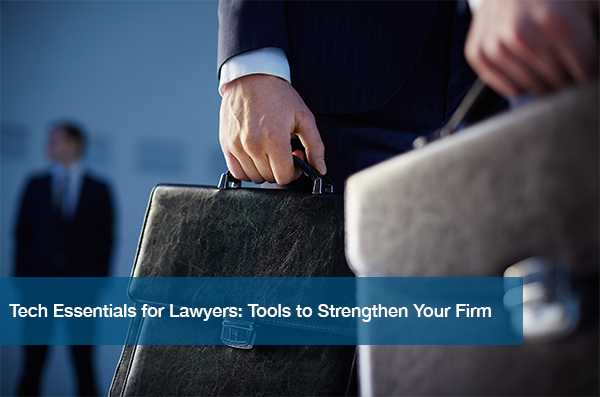 So, what are our major must-haves for a law firm? First, you must ask yourself one important question. Where do I have the opportunity to upgrade? Having a domain and email address that correlate with your law office name should be a given at this point. Don’t delegitimize your services by having an outdated email address. Using your firm name is easiest for both you and the client. It’s the first point of contact most of your clients will have with you. Your website is a key tool in how you brand your business, as explained in The Importance of Branding for a Small Business. Make sure it reflects your firm and looks great! For more information on what’s at stake with a poor website design, read our post The Harsh Reality of Having an Ugly Website. According to a recent legal tech survey, 73% of firms are still using Windows 7. Yet, the most recent system is Windows 10. Using an older system can throw off your entire office. The longer you wait to update, the bigger pain it will be to do so. After looking at what you already have, you can now look at what new programs and technologies you can add to your firm. It’s not a question of whether you need management software anymore, but which one? Once you have one, it’s smart to stick to it. It’s not easy to switch from one to another, so do your research! Do you want to buy physical software, or go to the cloud? Best way to decide what works best for your firm is to try a bunch out; majority of software companies offer free trials or demos! The modern law firm should offer a client portal where clients can interact with your firm. A portal gives a client peace of mind knowing that they can reach you at any point of the day. How you want to go about this is up to you, but many lawyers opt to put the portal access on the home page of their website. Using a cloud-based software library, legal documents can live anywhere! You can compile templates and alter them depending on the client and case. This makes it easy for you to send documents out to clients and fellow lawyers. The use of these softwares are endless for a lawyer. Whether you have a long distance client or feuding spouses, it’s just a smart way to increase efficiency and benefit your firm. Who can you turn to when your systems go down? At the end of the day, the most important tech asset for a lawyer is an effective IT specialist. Without reliable IT support, your firm can’t function properly. Your goal is to always be there for your client, and you can’t do that if you’re having computer issues. Since the beginning, we’ve been helping lawyers all over Texas save time, energy, and money with our IT support. We become your trusted partner in technology by becoming an extension of your firm as your full IT department. Schedule your free IT needs assessment to learn about what we can offer your firm today.